Here are common bakery questions folks have asked us over the years. Does the recipe for your fruit cakes ever change? Our recipe for quality never changes. That's why Claxton Fruit Cakes remain consistently delicious. Our cakes are approximately 70% "choice fruits and nuts," one of the highest such standards in the industry. Over the years, we have strived to maintain a consistent product backed by superior service. What is the difference between the "Regular" recipe and the "Dark" recipe, and which is more popular? Our "Regular" fruit cake recipe, a traditional favorite, is more popular than our "Dark" variety; however, the "Dark" cakes contain the same high quality fruit-and-nut content. The difference lies in the molasses, spices and natural, sun-ripened raisins, which give the "Dark" cakes their distinctive, darker color. Our "Regular" fruit cakes feature both golden and natural raisins along with imitation rum flavoring. The "Regular" recipe outsells the "Dark" by approximately eight-to one, but both offer fruit cake "at its Claxton best!" What is the recommended serving instructions for Claxton Fruit Cake? We advise our customers to thoroughly chill the product before slicing and serving. A sharp knife, moistened by a wet cloth, should be used to slice each cake. Whipped cream or a scoop of ice cream makes a great topping. Of course, a hot cup of coffee serves as the perfect complement to a hearty slice of Claxton Fruit Cake. What is the average shelf-life of a Claxton Fruit Cake? Under normal conditions, our cakes have a shelf-life of approximately six months. For extended keeping, we advise placing the cakes in a refrigerator. Our fruit cake may also be frozen. Does your plant offer guided tours? Unfortunately, insurance regulations prohibit us from conducting guided tours of our bakery. Our company is a fully-certified SQF facility which places high priorities on food safety and quality control. Our company store, located at the main entrance of our bakery, is open year-round, Monday through Friday, from 8:00 a.m. until 5:00 p.m. Our plant is located on Main Street, three blocks west of U.S. Highway 301 in downtown Claxton, Georgia, the "Fruit Cake Capital of the World." Come visit with us the next time your travels take you through our part of the country. How are Claxton Fruit Cakes different from other fruitcakes I see in stores, many of which sell for less? 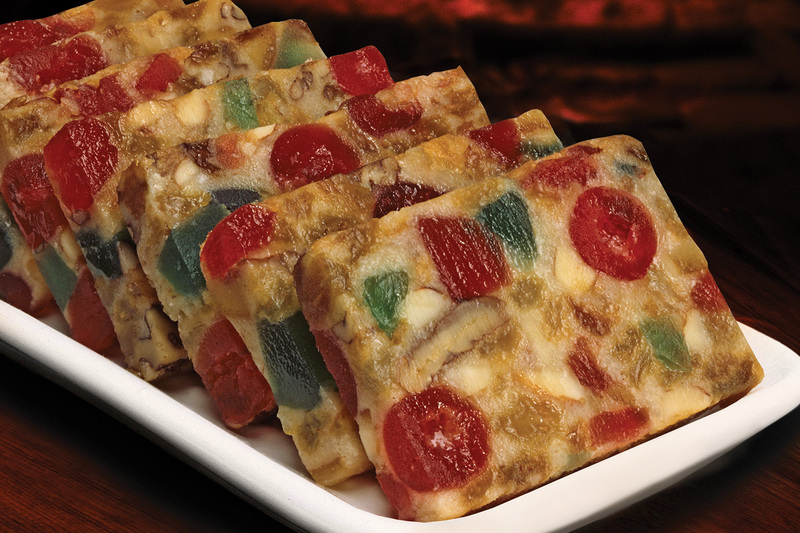 Unlike many so-called "fruitcakes," Claxton Fruit Cakes are chocked full of fruits and nuts. High quality fruit cake is the only product we produce, and we devote ourselves to maintaining the highest quality standards in the industry. Many fruit cakes are nothing more than pound cakes with a handful of fruits sprinkled on top. At our family-operated company, we offer true gourmet quality in every Claxton Fruit Cake we bake.